Business owners, the executive team and sales management can get very excited about implementing a CRM into their sales process. The thought of elaborate reporting tools and enhanced data collection and the promise of increased efficiency can blind them. They often forget how their sales teams and support staff will react to the thought of significant change. There are fears of "Big Brother" watching every move, extra administrative work to do, and the loss of their feelings of relevancy. I have seen all of these in play with companies that did not think it through. Here are a few things to consider that will make your CRM implementation projects run more smoothly. One flaw that I often see in the process of implementing a CRM is that management loses steam after the initial installation. The account managers grimace over feeling forced to use it, and no checks and balances are put in place for accountability. A mentality creeps in that using the CRM is optional, and, then, use becomes sporadic. CRM use should be part of the sales process and expectations. 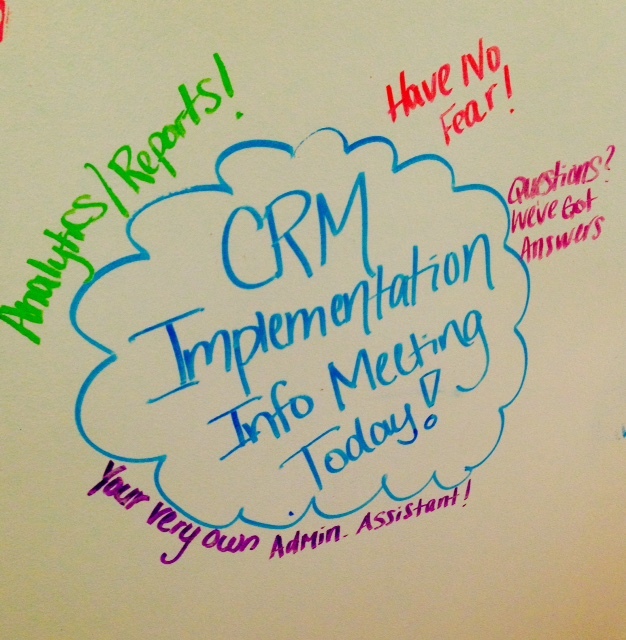 Sales management should use the information during periodic status meetings as well as during review time. In sales, we are all measured ultimately by our results. Looking at activities like calls, contacts made, information exchanged, and the specific targets achieved will provide a telling story of what went into those results. A CRM used the correct way will enrich a coaching session between a sales manager and account manager, reinforcing great tactics and pointing out areas for development. Nothing leads to buy-in like providing proof. CRMs are filled with analytical tools that you can use to create compelling stories. Select the most critical ones that show progress and trends, and make them part of your day-to-day verbiage with your sales team. They will continue to see how their use of the CRM leads to better data. You can then use that data to grow and reinforce their skills and activities to increase their success and to grow your organization as a whole. Teach your team how to use the analytics to monitor their own territory's progress. They will learn to live for the results. As they learn to read the trends, it will make their efforts more effective and agile if they see something that is not yielding the results that they desire. This is a tool that they can use to empower their own efforts and to learn to embrace the CRM platform. These often-neglected steps can be the difference between a successful implementation of a CRM and a poor one. Ultimately you want the CRM to be viewed and embraced as a tool that will enhance already good skills and make your efforts more effective and efficient.